Happy news for Memorial Day Weekend! 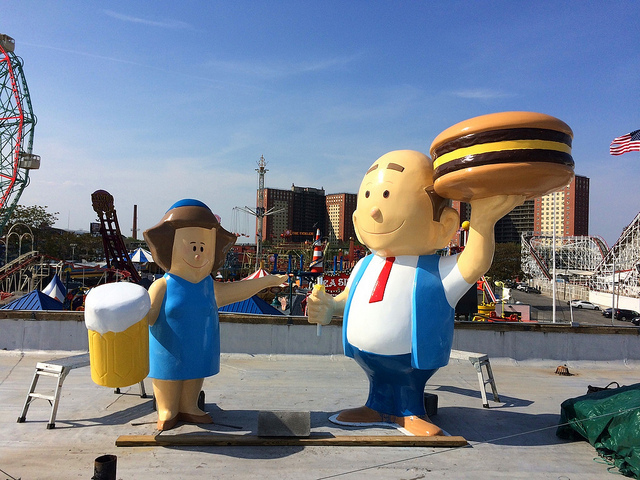 Mama Burger is back on her feet and has been reunited with Papa Burger on the roof of Coney Boardwalk eatery Paul’s Daughter! The lovingly restored and freshly painted figures were seen in close proximity the other day ahead of being returned to their regular spots at either end of the rooftop. While Papa Burger, an A & W Root Beer figure from the 1960s, has steadily anchored the western side of the building’s roof, Mama Burger had been flat on her back since Superstorm Sandy. The eight-foot-tall fiberglass figure got knocked over — at first she was thought to be missing— and her hamburger and beer mug blew away. What else is new this season at Paul’s Daughter? The popular clam bar now serves oysters as well and has a roomy new outdoor seating area. The best lobster roll in Coney Island – delectable chunks of Maine lobster packed into a toasted bun – is being served again starting this weekend. Since the Mama Burger figure never got her lost burger back, maybe she should hold a lobster roll instead? Paul’s Daughter is Tina Georgoulakos, whose father Paul aka “The Chief” co-founded the restaurant formerly known as Gregory & Paul’s in 1962 and still supervises its clam bar. The renovated building was originally one of hot dog inventor Charles Feltman’s restaurants and remains a masterpiece of vernacular signage. Rita’s Coney Island on Surf Avenue and West 15th Street. April 9, 2016. Rita’s Italian Ice on Surf Avenue across from the Thunderbolt roller coaster has a new owner, Joseph DeAngelis, and a brand-new schedule. It is no longer closed for the Jewish Sabbath – from dusk on Friday until sundown on Saturday– and is now open 7 days a week. That means you can get a frozen custard for the first time on Fireworks Fridays and on Saturday afternoons. Hours are noon to 10:00pm, with later hours during the summer months. Two years ago, this Rita’s franchise brought back frozen custard, one of Coney Island’s lost delights, to its place of origin. 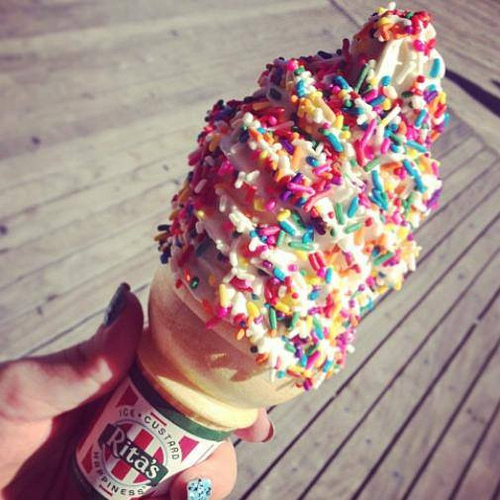 The dessert made its debut in 1919 when the Kohr brothers opened a stand on the Coney Island Boardwalk, selling 18,460 cones for a nickel apiece on the first weekend! Kohr’s Frozen Custard is still in business on the Boardwalks at Seaside Heights and Casino Pier on the Jersey Shore but Kohr’s has shown no interest in making a Coney Island comeback. Businesses in Coney which sell ice cream, gelato or soft serve hadn’t made any move to bring back frozen custard either, despite the recommendations of old-timers. 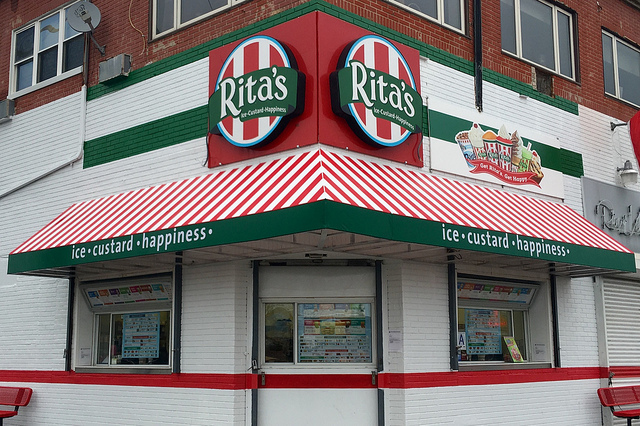 “Rita’s products are prepared under Star-K Kosher supervision and non-dairy is still pareve,” says DeAngelis, who is one of the franchise’s top operators, with five locations in New York’s Dutchess County. The Coney Island store has a clientele that reaches beyond seasonal visitors to the amusement area. It was a destination for Jewish residents of Brooklyn seeking kosher ices, nevertheless the business was struggling, according to DeAngelis. He was brought in by Rita’s to make a success of the location. Unlike the previous owners, who were observant Jews, DeAngelis is Catholic and does not have to close for Shabbat. The storefront got a fresh coat of paint and has already opened for the season, but DeAngelis says he’s planning a grand-re-opening celebration. Rita’s offers Italian ice, frozen custard, layered gelati, sundaes with a choice of toppings, sugar-free treats, and trademark items that blend Italian ice with frozen custard. The business is among a growing number of national and international franchises and chains leasing space on high-priced Surf Avenue in the new Coney Island. New York Primary: Who’s First to be Photographed Eating a Hot Dog at Nathan’s? Last April, when Hillary Clinton announced her campaign headquarters would be in Brooklyn, we anticipated she’d soon show up at Nathan’s for her photo op. What is she waiting for? Now that the New York Primary is competitive for the first time in decades and Nathan’s is celebrating its 100th anniversary, a trip to the People’s Playground is required to establish her Brooklyn bona fides. For Bernie Sanders, who was born and raised in Brooklyn, and moved to Vermont in his 20’s, being photographed eating a hot dog at Nathan’s and shaking hands with locals would be seen as a homecoming. UPDATE: April 8th… It looks like Bernie will be the first! We have confirmation that Bernie will be on the Coney Island Boardwalk for a 2pm rally on Sunday with security check-in beginning at 11am! Today, Ted Cruz went to a matzoh bakery in Brighton Beach and also to Coney Island, according to a tweet from the 60th Precinct. It’s sheer cluelessness of “New York Values” that he got this close and skipped Nathan’s. Meanwhile at Mike’s Deli in the Bronx, John Kasich showed an appetite worthy of a competitor in Nathan’s Famous 4th of July Hot Dog Eating Contest. In the previously unpublished photo below from the archive of Famous Nathan director Lloyd Handwerker, Nathan welcomes the Democratic candidates in the 1961 municipal election to his hot dog emporium. Robert F. Wagner for Mayor, Abe Beame for Comptroller, and Paul R. Screvane for President of the City Council went on to defeat the Republicans. The historic 1960’s hot-dog shaped Coney Island Boardwalk restaurant in Bailey, Colorado, is up for sale again. Somebody is going to be sorry they didn’t buy it in 2011. The asking price is triple what it was back then, making it perhaps the priciest hot dog ever. According to local news reports, owner Ron Aigner is retiring and has listed the property for $1,495,000. The diner’s designer Marcus Shannon of Lakewood, Colorado, planned a chain of hot dog diners and filed a patent for the design in 1965. The eatery was originally located on West Colfax in Denver. Since 1970, the Coney Island Boardwalk has been on scenic US Highway 285, first in Aspen Park and then in Bailey, about 30 miles southwest of Denver. The bun is 35 feet long and the hot dog 42 feet. Made of concrete-and-steel, this fine example of novelty architecture weighs a hefty 18 tons. The first photo in this post was taken by our friend RoadsideNut, a New Yorker who has extensively documented America’s roadside architecture on her website. Check out the Burgers and Hot Dogs page, where the Coney Island in Colorado appears along with Top Dog, Giant Burger and other architectural wonders. 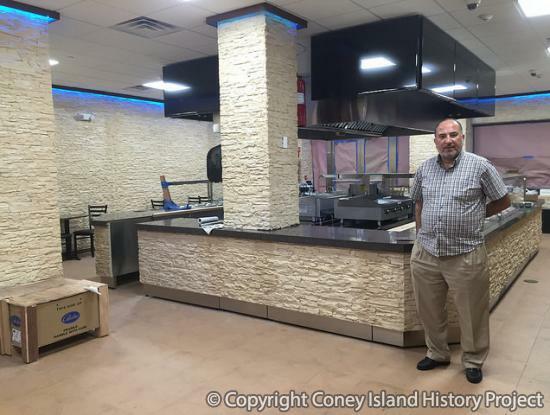 In Coney Island’s Stillwell Terminal, Magic Gyro, a Mom and Pop destroyed nearly three years ago by Hurricane Sandy, is about to reopen, and a Checkers hamburger franchise is set to debut. Magic Gyro owner Levent Demirgil told ATZ that he will be training employees this weekend and plans a soft opening next week. “We suffered a lot from Sandy,” Demergil said in an oral history interview recorded in Turkish for the Coney Island History Project’s immigrant narratives series. “We didn’t have insurance. I took personal loans. By taking those we are trying to stay afloat, that’s why we could not open here for three years.” Formerly a gourmet shop with a corner kitchen, the new store will be a Mediterranean Grill featuring healthy fast food such as hummus, salads, and döner kebabs. Meanwhile, construction has resumed on the north side of Surf’s Franchise Restaurant Row. Next door to Checkers, the Johnny Rockets “Coming Soon” banner is tattered, but the long stalled construction on the burger franchise, whose themed decor is based on retro diners, is once again underway. “They are laying the plumbing under the concrete floor and pouring the concrete next week,” says broker Joe Vitacco, who gave us an update on a lease deal that he closed nearly three years ago in December 2012. “You ask why we don’t do Mom and Pops,” Vitacco added, referring to our ongoing conversation that began with ATZ’s 2012 post “Will Coney Island’s Surf Ave Become a Mecca for Franchises?” He says that Mom and Pops wouldn’t be able to afford this, referring to the extraordinary delays and ballooning costs due to city and MTA red tape. On Surf Avenue across from Luna Park, construction on a 5,400 square-foot IHOP has finally begun eight months after construction was expected to begin. The franchisee is Bryan McKenzie, who is also the owner of an IHOP in New Jersey. The delay was due to bureaucratic snafus at the City’s Department of Buildings. At the beginning of this year, ATZ reported the construction had been delayed by new and ever-changing post-Sandy building regulations. Johnny Rockets was waiting for approval of a storm surge resistant front. Construction had been stalled for so long that skeptical members of the Coney Island Rumor Mill doubted it would ever resume. The one-story building at 1019 Surf is a longtime furniture store, which is not among the use groups permitted by the city’s zoning. The space is being subdivided into six storefronts by the landlord and the stores are getting new street numbers. IHOP will combine the three stores on the far left and the Subway Cafe has the one on the right. The two remaining storefronts totaling 3,000 square feet were in fact snapped up yesterday by a Mom and Pop for a kosher pizzeria and ice cream shop, which will also have a party room for kids’ birthday parties. May 14, 2015: Coney Island 2015: Red Doors Bar & Grill Opens on North Side of Surf Ave.
Mazel tov! 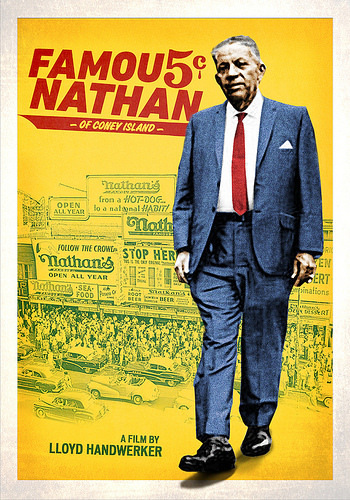 We’re happy to report that “Famous Nathan,” Lloyd Handwerker’s documentary about his grandfather, who founded Coney Island’s Nathan’s Famous nearly a century ago in 1916, is getting a theatrical run this summer. After premiering last year at the Tribeca Film Festival, the doc screened at film fests from Coney Island to Jerusalem. The film opens on July 17 for a one-week engagement at the Cinema Village in Manhattan, including some Q & A’s with the filmmaker, followed by a July 31-August 6 run at Laemmle Music Hall in Beverly Hills. New York-based indie distributor Film Movement will release the Handwerker doc in North America across multiple VOD and digital platforms on August 4th, with a DVD release on September 29th. Pieced together over a 30-year period, the film was a labor of love for the filmmaker, who was 17 when his grandfather died. It is also a remarkably candid family memoir. As we wrote last year after seeing the film at Tribeca: Nathan Handwerker, the founder of Nathan’s Famous hot dog empire, is a mythic figure in Coney Island history. The story of the young Polish immigrant working at Feltman’s and saving his salary to open a competing restaurant where hot dogs sold for a nickel instead of a dime is the stuff of legend. His grandson Lloyd Handwerker’s documentary “Famous Nathan” humanizes him and at the same time makes us see that he truly was larger than life. Famous Nathan directed by Lloyd Handwerker, July 17-23 at Cinema Village, 22 East 12th St, New York, NY. Q & A’s with the filmmaker will be held at the 7pm shows every night, plus the 9pm shows on July 17, 18 and 23, and at the 5pm show on Sunday, July 19. Arancini Bros. Rice Balls now available during Brooklyn Cyclones games at MCU Park. 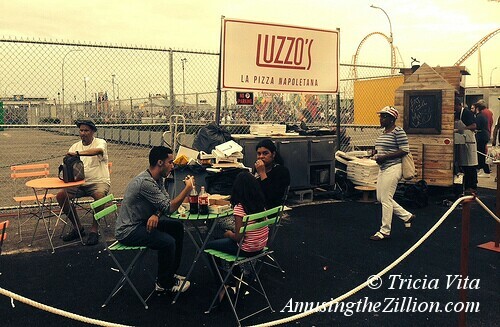 Photo via Arancini Bros.
Italian street food is popping up this summer in Coney Island’s amusement area. 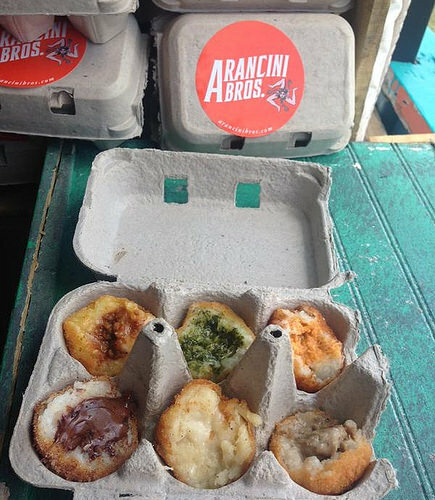 Bushwick’s Arancini Bros– whose motto is “We’ve got balls!”– is serving their Sicilian rice balls during Brooklyn Cyclones’ games at MCU Park. 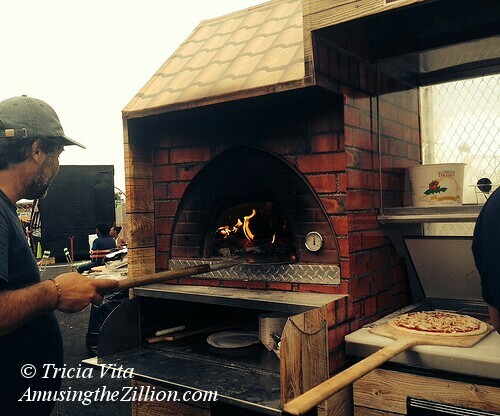 On the Bowery at Stillwell, Luzzo’s, which has an old-school pizzeria with a coal-burning oven in the East Village, is making wood-fired pizza from a mobile cart with a tiny oven. Six varieties are offered at MCU Park, priced at three for $6 or six for $10. There’s Classic Ragu (saffron risotto with tomato meat sauce peace and mozzarella); Bianco Verde (Basil Pesto w Mozzarella); Buffalo Ball (Spicy Chicken with Gorgonzola Cheese); Philly Cheese-Steak (grilled rib-eye, caramelized onions, provolone cheese); Bucatini Fritti (Italian-style mac & cheese) and Nutella (Cinnamon risotto with chocolate hazelnut, rolled in cinnamon sugar). We only wish they sold the rice balls outside the ball park too! The Luzzo Group headed by Neapolitan pizzaiolo Michele Iuliano operate a quintet of restaurants as well as pizza carts in Manhattan and Brooklyn. Their cart in Coney Island debuted over the July 4th weekend and is set to stay the summer, according to its manager Anisa. Luzzo’s is located on Thor Equities property on the Bowery, across from the Brooklyn Nets Shop and the yet-to-open Wahlburgers, and has a roped-off seating area. The personal-size pizza comes in two varieties: the Margherita, with tomato sauce and fresh mozzarella ($6.00), and the Diavola with spicy salami ($8.00). Also on the menu for $2 each are Rice Balls (rice, meat, fresh Mozzarella) and Potato Croquettes. While new is news and street food is convenient, if you’re looking for an Italian sit-down restaurant in Coney Island, you should keep in mind two of the City’s and the neighborhood’s oldest and most revered: Totonno’s Pizzeria Napolitana on Neptune Avenue since 1924 and Gargiulo’s on West 15th Street since 1907. As ATZ previously reported, the Russo Brothers, owners of Gargiulo’s, which is Coney Island’s bastion of fine dining, are planning to open a fast food Italian restaurant on the north side of Surf. 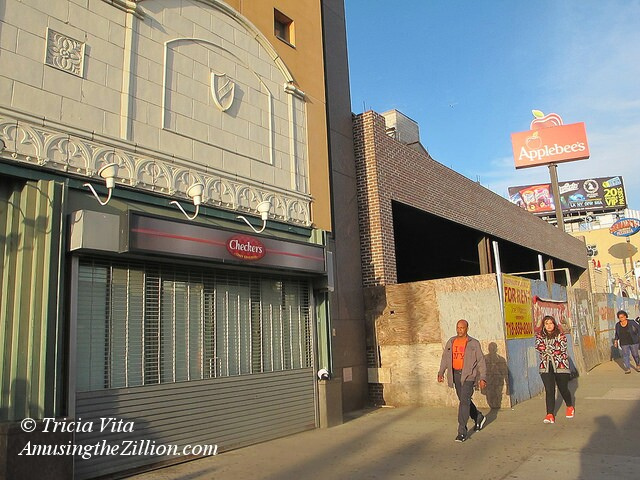 December 19, 2012: Will Coney Island’s Surf Ave Become a Mecca for Franchises?